It is short and stout, blue accented white and clean looking. With this simplistic packaging, it makes you imagine that this serum is everything you need. The product focuses on its claim that it is non-irritating and can heal the problem immediately while controlling unsightly nail problems without the use of Tolnaftate. This claim is taken into consideration by many as evidenced by reviews and information online. When using the serum, apply it over the nail twice daily. It could even be applied even if you have artificial nails or lacquer on it. There are no side effects. Just be careful in using as there is no brush applicator, so putting it on nails may risk you running on an oily mess. It is priced at $12.78 per 1.0 oz. There is no guarantee indicated on the box or on the site. It is patent-pending and is salon tried for effectiveness. 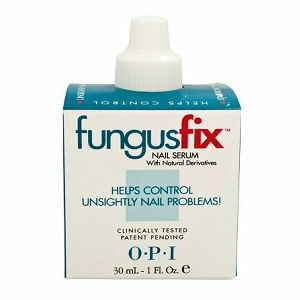 OPI Fungus Fix is still on its way to be patented and used for many to treat fungus. For $12.78 an ounce, it is cheap but the only thing which makes it not preferable for many. It contains Undecylenoyl Glycine and Usnic Acid contained in a serum form which is oily in appearance. These ingredients are proven anti-fungal substances but only works on the skin area. Jack Stevens	reviewed OPI Fungus Fix	on August 10th	 and gave it a rating of 3.